Social media isn’t exactly a new concept, but the morning shows are making a big deal of it in hopes to gain more viewers. “This will revolutionize how our show is produced in the morning and its all about engaging directly with our viewers from beginning to end,” said “GMA”‘s Senior Executive Producer Tom Cibrowski. 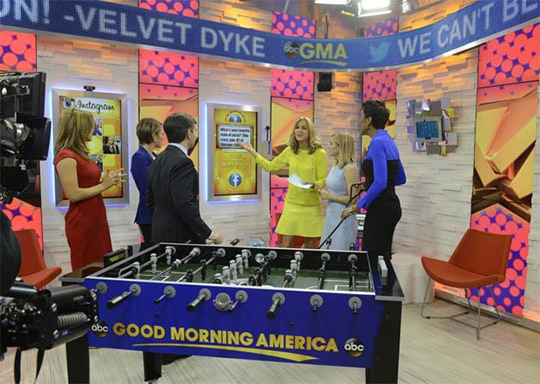 The new studio space hopes to engage with fans, guests and hosts… though I doubt George Stephanopoulos will ever play foosball. A ribbon LED works its way around the header with multiple touchscreen monitors. Pops of color break up the space and the stone walls. Lighting is similar to the “Orange Room,” clearly showing it’s not meant to be a full time television area. 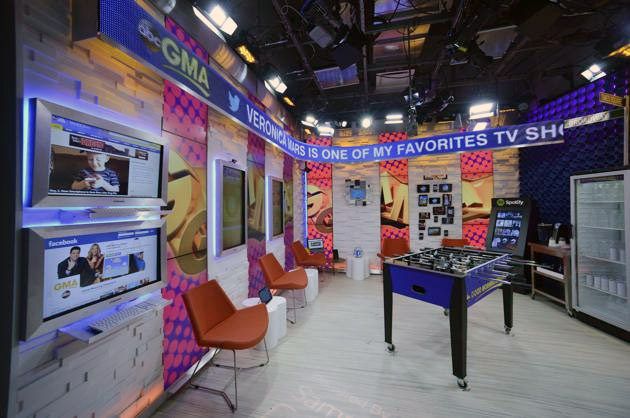 The space is an expansion of the existing ground floor Times Square studio and matches the overall design of the “GMA” set by Seth Easter Design. View a tour of the “Social Square” on the ABC News website.